Department of Neurology, Hope Center for Neurological Disorders, and the Charles F. and Joanne Knight Alzheimer’s Disease Research Center, Washington University in St. Louis, St. Louis, Missouri, USA. Address correspondence to: David M. Holtzman, Department of Neurology, Hope Center for Neurological Disorders, Charles F. and Joanne Knight Alzheimer’s Disease Research Center, Washington University School of Medicine, 660 S. Euclid Avenue, Box 8111, St. Louis, Missouri 63110, USA. Phone: 314.747.0644; Email: holtzman@wustl.edu. J Clin Invest. 2019;129(3):969–971. https://doi.org/10.1172/JCI127578. Alzheimer’s disease (AD) is the leading cause of dementia, and its pathogenesis is initiated by the accumulation of amyloid-β (Aβ) into extracellular plaques. 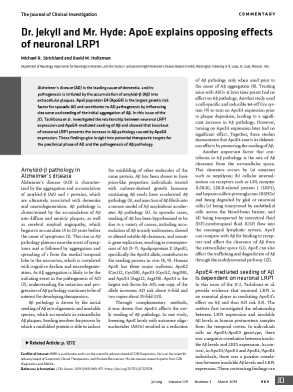 Apolipoprotein E4 (ApoE4) is the largest genetic risk factor for sporadic AD and contributes to AD pathogenesis by influencing clearance and seeding of the initial aggregation of Aβ. In this issue of the JCI, Tachibana et al. investigated the relationship between neuronal LRP1 expression and ApoE4-mediated seeding of Aβ and showed that knockout of neuronal LRP1 prevents the increase in Aβ pathology caused by ApoE4 expression. These findings give insight into potential therapeutic targets for the preclinical phase of AD and the pathogenesis of Aβ pathology.